Foodback is ready in minutes, literally! Forget about large implementation projects, workshops and meetings. Trust us, we have you covered! Foodback Analytics is made for busy horeca people! We make it super simple to see exactly where you perform well, and where you need to adjust. Foodback constantly monitors your venues, so you can make sure you utilise your resources the optimal way. If you need help, we have experienced advisors ready. With Foodback Intelligent Survey Engine, you always get a set of questions, taliored for your type of venue! 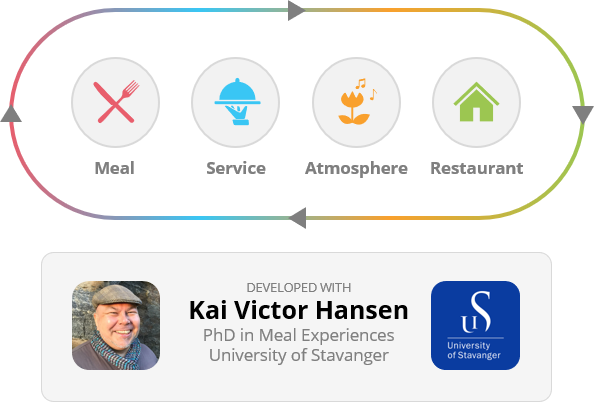 Our unique survey engine is built in close collaboration with Kai Victor Hansen, a highly respected professor at the Norwegian School of Hotel Management. It makes sure each guest gets a quick and smooth user experience, while you get powerful insight with industry leading depth and detail. With Foodback, you’ll have more customer feedback than you have ever imagined! This is what the tech guys refer to as “Big Data”. To get the most out of this information, we have built a simple, yet powerful business intelligence tool. In here we give you both the high level overview, and precise recommendations on where you need to improve. What Kind of Venue Do You Run?